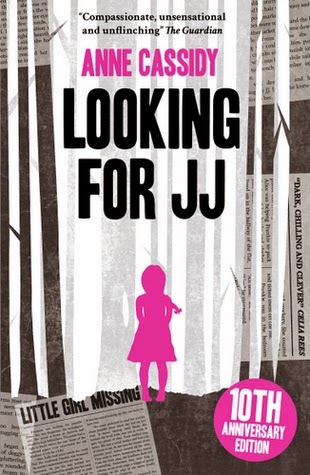 Looking For JJ by Anne Cassidy was first published in 2004. But for a book more than 10 years old, I felt like Looking For JJ felt very much important and relevant to the events today. It was thought-provoking and gripping and I felt like it had some very interesting things to say about the media and about guilt. This book is told in several parts about one girl. A girl who at the age of 10 went out into the woods with two of her friends. And on that day, only two of the three girls came back. Since that day, our main character has spent six years in prison because of her involvement in the death of her friend and now, she has been released, has changed her name to Alice Tully and is living in secret with her social worker trying to lead a normal life. Only she has been written about constantly in the papers and feels constantly uncertain about her freedom and privacy based on how much interest the public and media has taken in her. I think the portrayal of the media representation is one of the most interesting aspects of this book. The main character of Looking For JJ was once known as Jennifer Jones and has been written about in the papers for years. Everyone thinks they know everything about JJ, the child murderer, and everyone has an opinion on whether or not she should be free and about what she should be doing and it feels as though through the media portrayal of this crime, the public feel they have this right to know every detail about JJ and what has become of her while at the same time assuming they know the true story when they really don't. I think that aspect of the story is the most interesting. The other part of this story is getting into the head of Alice Tully and seeing how she reacts to her freedom and everything on the outside. How she struggles with her relationship with her mother after all these years. How she's found a boyfriend and a job and a place to belong but also feels like she doesn't deserve happiness or the right to go on living after having taken the life of her friend. There's also this awful feeling of having a new life and this new identity and the prospect of happy times ahead at university but also knowing that if the media find out about her new name all of that could be taken from her again. Looking For JJ goes to a very dark place. Which shouldn't have been surprising at all considering it is the story of a child murderer. But I was very surprised to see the darkness and intense turns in JJ's childhood story. JJ, as a child, has a very unstable relationship with her mother. A relationship that involves neglect and throughout the story goes increasingly to places that felt very disturbing and uncomfortable. And at the same time, JJ's friendship mirrored some of these complicated feelings as with JJ and her mother. It was all a mess. I found Looking For JJ to be a really fascinating and surprising read. It really made me think and feel and I highly recommend that you pick this book up soon if you too have not yet read it.